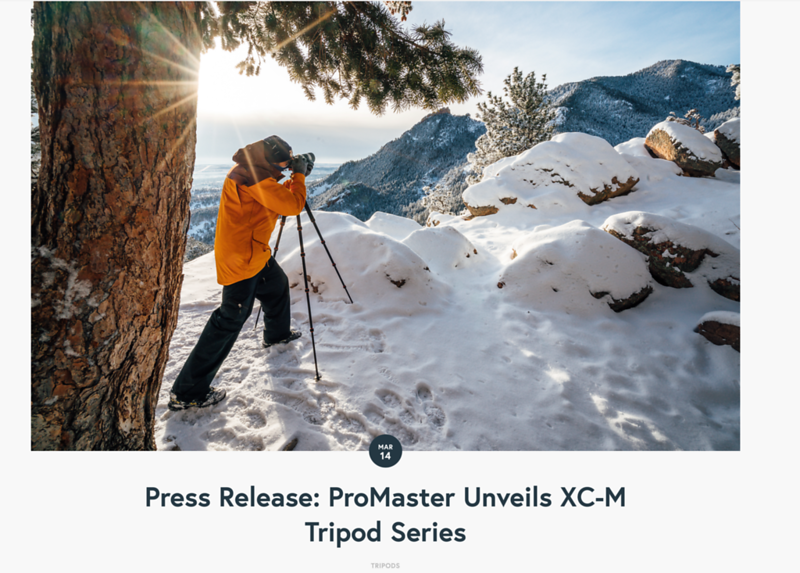 I create a small library of content for ProMaster to use for the launch of their XC-M 525 tripod. Here you can see examples of my work being used in marketing and advertising on their website during the launch of their tripod campaign. Here are a few of my favorite images that I captured and edit for N-Camp™ This project was complete through an ambassador program called: We are a Wild Tribe. 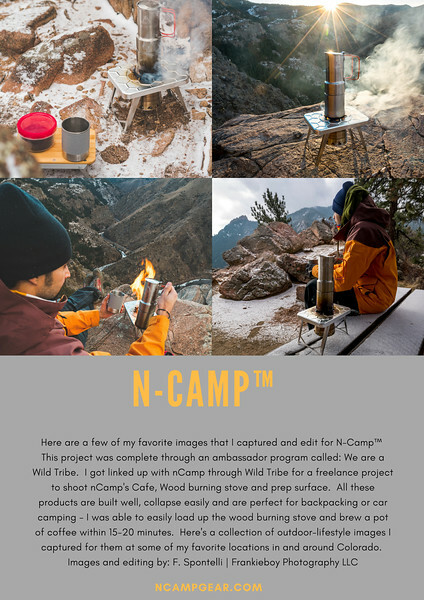 I got linked up with nCamp through Wild Tribe for a freelance project to shoot nCamp's Cafe, Wood burning stove and prep surface. All these products are built well, collapse easily and are perfect for backpacking or car camping - I was able to easily load up the wood burning stove and brew a pot of coffee within 15-20 minutes. Here's a collection of outdoor-lifestyle images I captured for them at some of my favorite locations in and around Colorado. Here is a collection of my favorite adventure-style images that I captured for Honey Stinger. 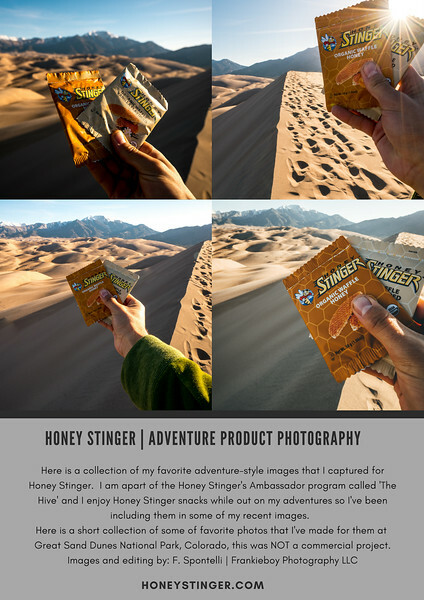 I am apart of the Honey Stinger's Ambassador program called 'The Hive' and I enjoy Honey Stinger snacks while out on my adventures so I've been including them in some of my recent images. 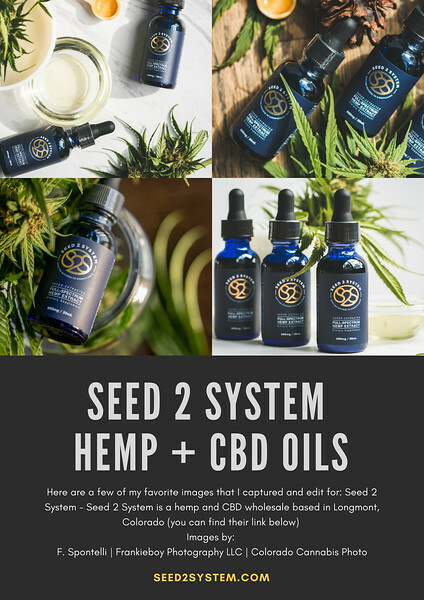 This project was complete for Seed 2 System which is a hemp cultivation, CBD and hemp wholesale company based out of Longmont, Colorado. We had the unique experience of going to visit their incredible outdoor hemp farms to capture the growth of the hemp - we were invited back to do a collection of harvest photography and also product photography. Although I have captured many indoor medical cannabis grows here in Colorado this was my first time shooting at an outdoor grow in Colorado specifically and out door hemp grow. I partnered with Mark Munson who helped capture video while we visit the various Hampton Farms and different cultivation facility use. You can see his final video edit (coming soon) where we highlight different components of the seed to system philosophies, part of which is being 100% organic. I also completed some e-commerce photography and product lifestyle photography for them which can be seen in the examples below. I really like how these images turned out, my girlfriend helped me pick out some elements from the hobby store to further add to that feeling for these final images. 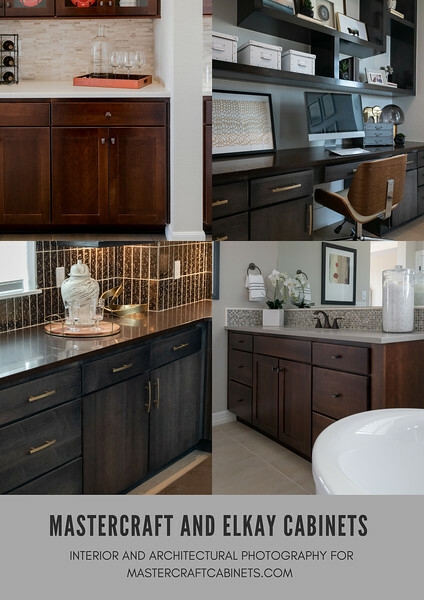 The woodgrain images are average to me however the images captured on the white marble looking texture are above average in my opinion and I really enjoyed creating this set of work. To complete the images I took them into Adobe Lightroom for a little bit of color correction and added some different presets and product filters that I have created across on my other product photography work. 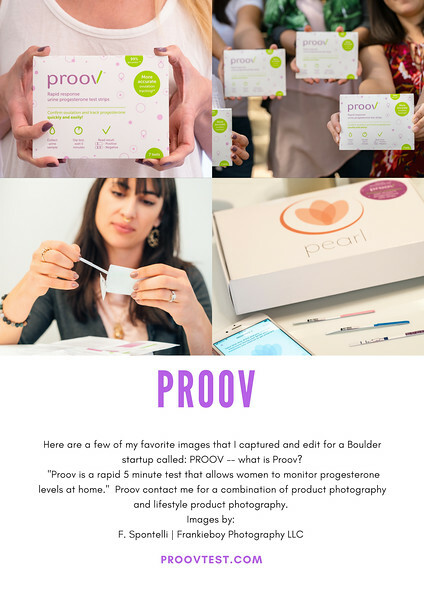 I was contact by Proov to create a mix of content for their Boulder, Colorado start up that has create a product for 'rapid response progesterone test strips'. We used a brightly lit bathroom to showcase a variety of products including the Proov test strip kid. 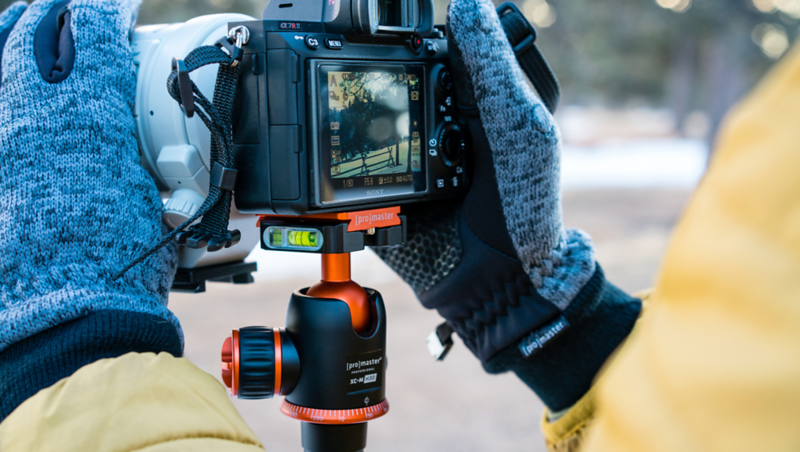 We create photo series to demonstrate how the product is used, how to read the results and other applications for their product. We also spent part of our photography session having each model/helper open the packaging, examine the contents, ran through testing the test strip, reviewing the results and reading the package instructions. After this portion of the photo shoot we took the group for a short photo-walk to capture images of the Proov team and bring some life to the photo shoot by taking the products outside into the natural, day light. For this project we developed a series of mood boards and create brand guidelines I also spent time coordinating a few models to help me with a lifestyle product photography shoot. 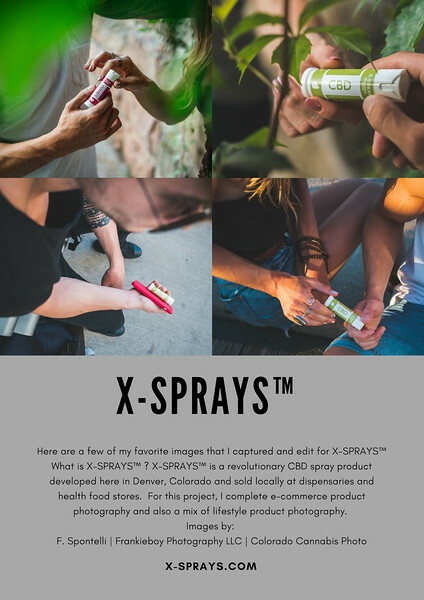 The product is a breakthrough CBD sublingual spray called X-SPRAYS — for the photo shoot we captured a variety of images and different scenarios to showcase the versatility and different types of sprays offered by this CBD company. 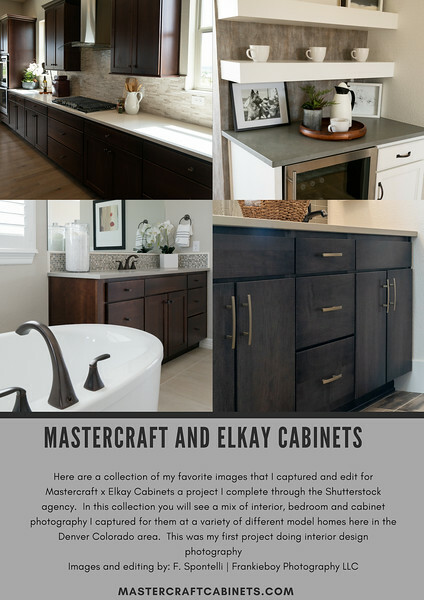 We also shot a series of informational images so that we had instructional images for infographics and how to use our product pamphlets. The locations that I selected for this photo shoot were in and around Union Station and also the riverfront park walking area. We shot a few set ups in the grass for more of a summer feel and we also walked around with the products to catcher different lighting settings and to show different scenarios for the product. In addition to the lifestyle product photography seen here I also complete: e-commerce photography, product lay downs and product instructional video for X-SPRAYS. What is X-SPRAYS™ ? X-SPRAYS™ is a revolutionary CBD spray product developed here in Denver, Colorado and sold locally at dispensaries and health food stores. For this project, I complete e-commerce product photography and also a mix of lifestyle product photography. 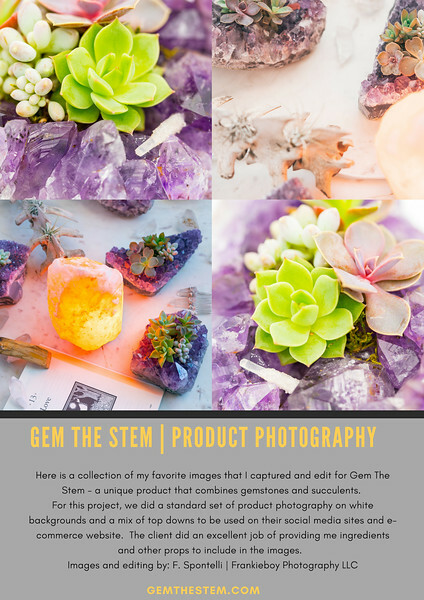 Here is a collection of my favorite images that I captured and edit for Gem The Stem - a unique product that combines gemstones and succulents. For this project, we did a standard set of product photography on white backgrounds and a mix of top downs to be used on their social media sites and e-commerce websites. The client did an excellent job of providing me ingredients and other props to include in the images. 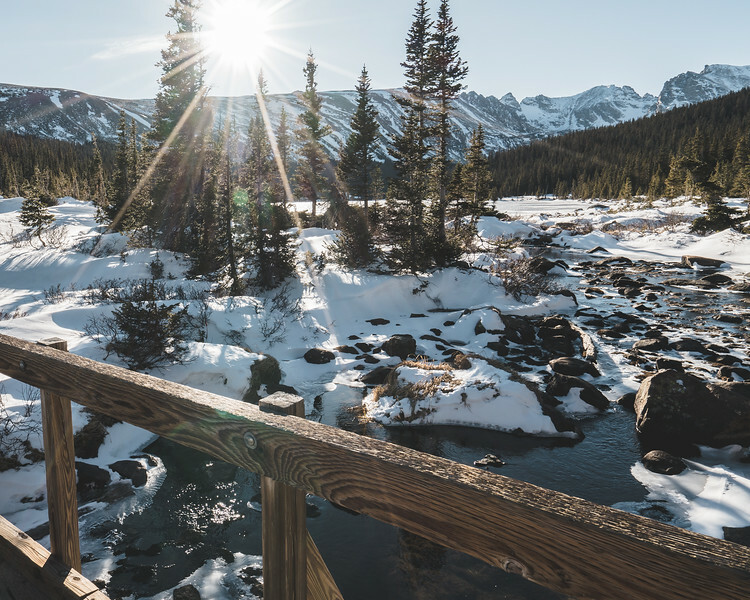 A long but extremely scenic hike tucked in Colorado's Indian Peaks wilderness. Due to winter road work and road closures this will add 4 miles to the normal 2.3 mile trail. This portion of the hike is frustrating because you are walking along a closed road, exposed to wind and conditions for 2 miles before reaching the trail head. Be warned - the winds in this area can be extreme so check weather, twice before heading out to do this hike. Today’s tip is all about gaining traction and creating momentum for your freelance photography business. Something that has helped me create more traction for my freelance business would be saying yes to opportunity. No matter how you apply your camera for various work projects there is a good chance there is someone out there willing to pay you for your work and your time – it’s a matter of finding those individuals. As soon as I started to say yes to more random opportunities I immediately felt like more connections were made and other opportunities began presenting themselves. When i say Random I will start with my story in which i was reached out to for two images for the cover of magazine features for Parker and highlands life style magazines. As messed up as this sounds there is already someone doing your job for free whether they have a smart phone or an expensive camera; people are already out there giving their work away for free (and it absolutely kills me too). However; when a local magazine reaches out to you to use two of your images on the cover of their magazine I highly recommend saying yes — IF and ONLY IF they promise to credit you for your work. Because I opened myself up to this opportunity and said “Yes” instead of “No” it has opened the door to many other photography projects for me. Because I was personable and easy to work with the magazine editors approached me to do six other PAID photography shoots plus meeting leads for new photo work. This takes me back to my original point about how important it is to remember to say Yes and consider any opportunity as it may open the door for more work. There are many ways to make money using your camera, this is just one small example about how I turned one unpaid opportunity into more consecutive paying photography gigs. This was taken during summer camping season of 2017 - we found a really great spot somewhere hidden in Mt. 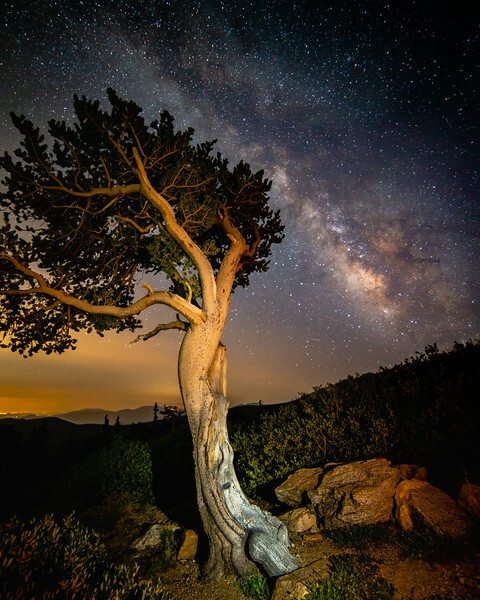 Evans wilderness and set up camp for Milkyway shots and sunrise photography. 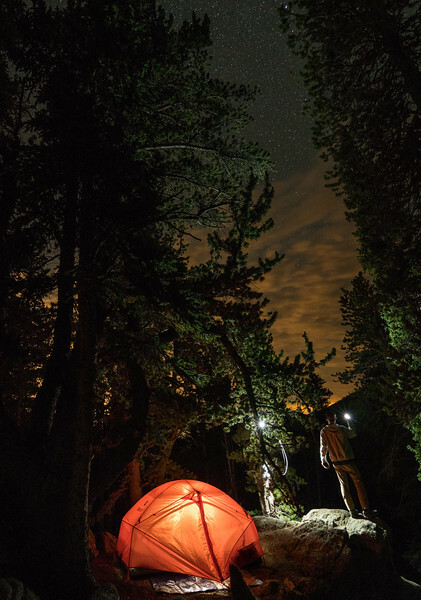 Before heading to Echo Lake to shoot Milkyway images I turned on my LED light inside my tent and we stood still for about 20-seconds. Admittedly the light in the tent is slightly too bright, but to make shots like these happen your going to need an LED or small tent light. I setup my tripod and set my camera to standard astrophotography settings: WIDE 16mm F4 and tried a few different lengths to see which one looked best. 20 seconds seemed to do the trick with the F4 still allowing for some crisp detail and contrast in the stars and night sky. Another tip would be to stand really still and take a few different exposures because there's a chance you'll be moving in one or two. Also, we shine the light up, down and at our feet to give the image a sense of scale and to show some people looking out at the view. As soon as Spring hits I am looking for new places to camp and explore. This campground (Hermit Hollow) is just outside Estes Park, Colorado and a short drive into Rocky Mountain National Park. I experienced seeing my first bear at this camp site, nothing more than a hungry Moma bear trying to find some food for her cub. Beware of shooting at night here, but overall an amazing campsite with fantastic views and sweet spots for sunset and sunrise photography. Not to mention the close proximity to RMNP, if your looking for a campsite and new area to explore check this spot out. 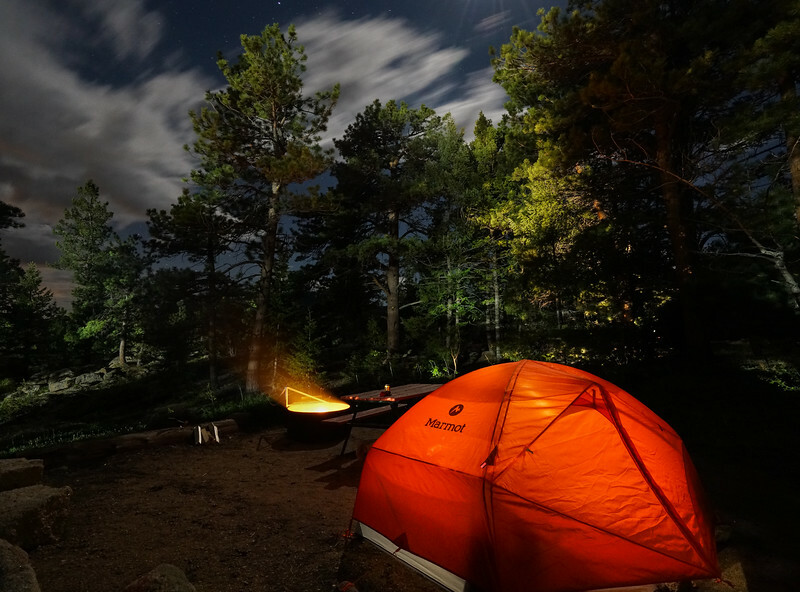 Aside from the bears at night, campground was peaceful and I enjoyed listening to the fire crackle underneath the dark Colorado skies as the moon rose above me. The first loop of campgrounds has some phenomenal sites, some with picture perfect views of the valley just outside camp. 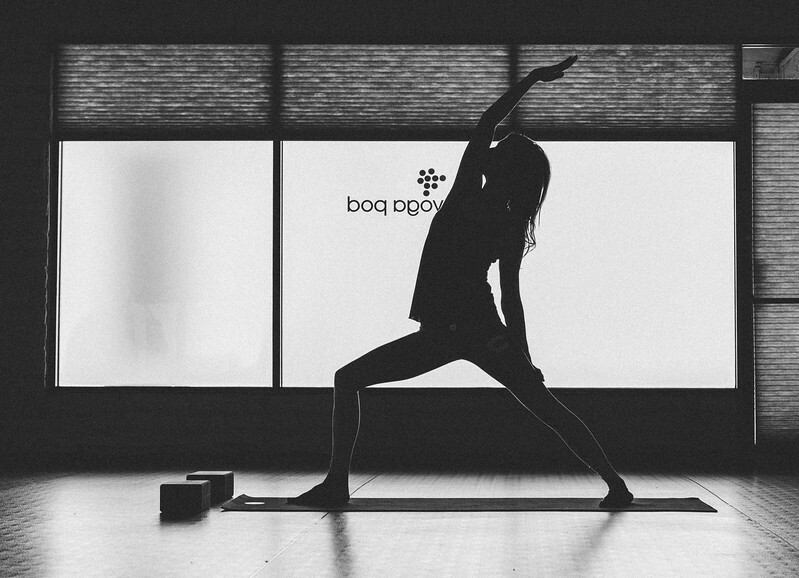 Constantly in motion - we are always moving, humans never stop moving. 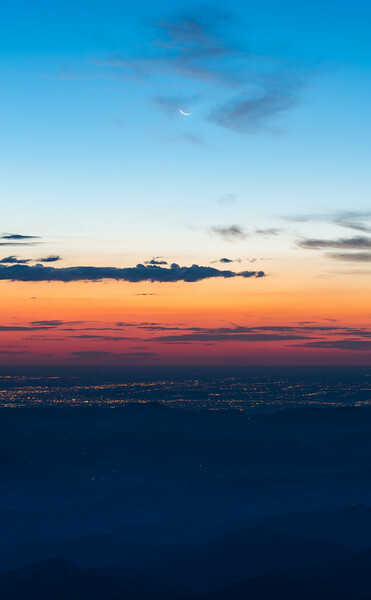 Here's a unique spot I found using the Outbound App - this is a great location that looks West into the Rockies just outside of Denver, Colorado. 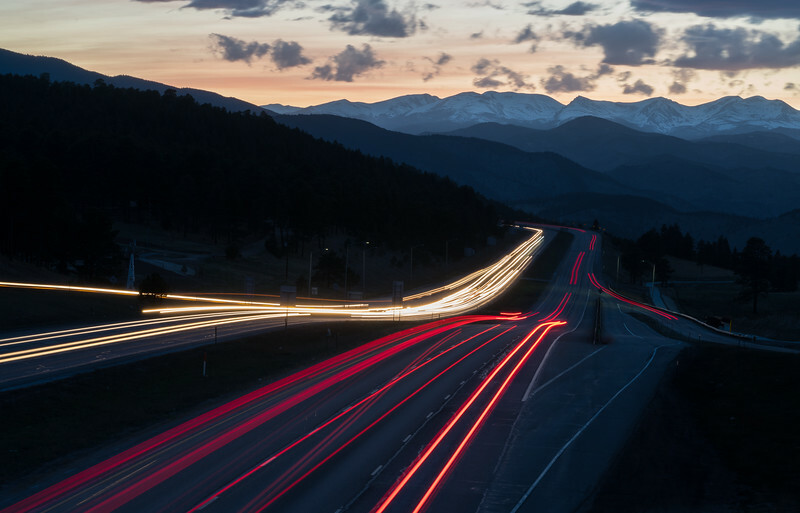 During some beautiful light and conditions you can capture an epic sunset and a side of amazing light trails from the always busy I70 West. From time to time I'm able to go back and dig through my travel archives of photography, here's one I found recently from traveling to India. 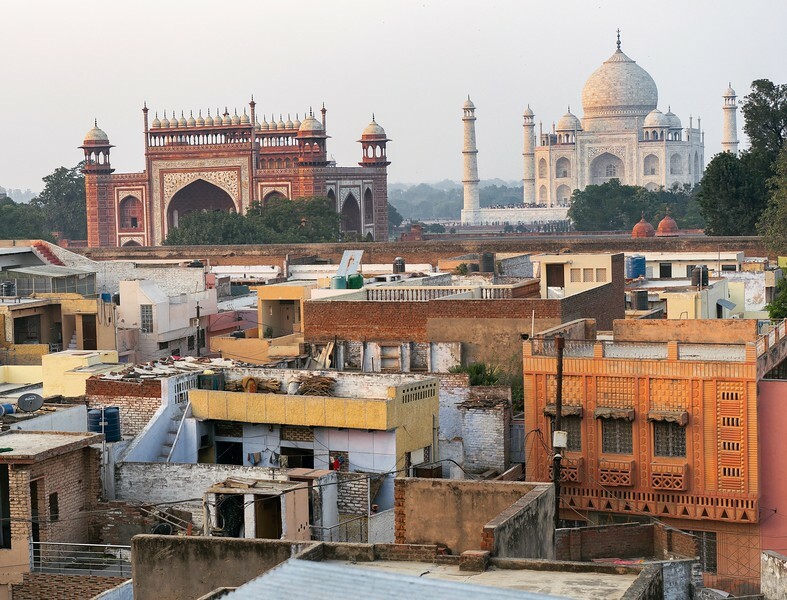 We had settled into Agra, India for the night in anticipation of shooting the Taj Mahal in the morning light. We left for dinner and found a rooftop spot to watch the sunset on one of the most beautiful wonders of the world. India is a crazy place to visit indeed, if you have the chance to travel there take it! It will certainly be a once in a life time opportunity. Learn more on our travel blog: meetyouthere.me if you need any travel to India tips.